Obituary of Erma B Clark - R.T. Foard Funeral Home, P.A. 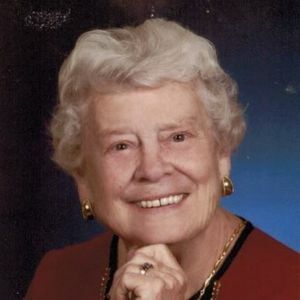 Erma B. Clark, age 88 of Elkton, MD, passed away Sunday, June 3, 2018. She was born on Nov 2, 1929 in Wilmington, DE to William L. Archibold and Edna E. (Borer) Archibold. Erma was a secretary at Stauffer Chemical in Delaware City, DE and at the Du Pont Glasgow Site until her retirement. She moved to Florida where she lived for 10 years and loved every minute of it. She returned to Elkton for health reasons in 2003. Erma was an active member of Rock Presbyterian Church for 55 years where she was a member of the choir and served as a Deacon. She enjoyed music and flowers and loved to dance at any opportunity. Erma enjoyed traveling both within the United States and internationally. Erma's greatest joy was found in spending time with her cherished family and dearest friends. Erma was diagnosed with Alzheimer's disease in 2009 and was effectively lost to us two years later. She lived at Calvert Manor Healthcare Center for the past 8 years where she was quite content and comfortable. Erma was well known there for her infectious smile and sparkling blue eyes. The family would like to send a special thank you to the caregivers at Calvert Manor Healthcare Center for their wonderful care over the last 8 years. Erma is survived by her son, Jeffrey (Dawn) Clark; two daughters: Linda Duffy and Deborah (Jerry) VanDyke; eight grandchildren: Matthew VanDyke, Mary Brown, James A. Duffy, Jr., Kenneth C. Duffy, Patrick R. Duffy, Stephanie M. Clark, Kaitlyn E. Clark and Kristen E. Clark; and four great-grandchildren: Noah C. Duffy, Owen R. Duffy, Lilly B. VanDyke and Madeline E. VanDyke. In addition to her parents, Erma is preceded in death by her husband, Kenneth L. Clark and their son, Kenneth L. Clark, Jr.; her sister, Mary Elizabeth Johnston of Evergreen, Colorado; and Erma's companion and dancing partner of 30 years, Mark H. Shockley. A memorial service will be held in Erma's honor at 2:00pm on Sunday, June 17, 2018 at Rock Presbyterian Church, 30 Rock Church Rd, Elkton, MD 21921, where family and friends may begin visiting at 1:00pm. In lieu of flowers, memorial contributions may be made to the Rock Presbyterian Church Memorial Fund. Add your thoughts, prayers or a condolence to Erma's guestbook. In lieu of flowers, memorial contributions may be made to the Rock Presbyterian Church Memorial Fund. Please enhance this tribute to Erma by adding your memories and photos.